All memberships backed by our 7 day, money back guarantee! CLICK HERE for University membership options with “Hands On” advice & recommendations over the next 90 days for $69. University 90 Day Membership Pack, Just $69: Includes The "Hands On" Advice & Private Facebook Group (50% off first month)! 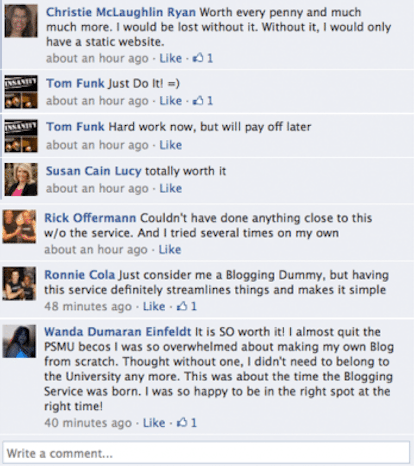 The Blogging Service was created by Top Performers for future Top Performers, including over $1,000 in extras! CLICK HERE for Blogging Service membership options starting with a 90 DAY PACK for just $57! Everything you need to get your business ready to go! What is the "Hands On" difference. Simply put, you can't get "Hands On" individual reviews and detailed advice on every important aspect of your marketing, including the selection of a perfect customer, your personal brand, offers, ads, ad audience, live campaigns and more! This isn't part of any other training out there, even those costing thousands of dollars. Let us be your personal success Coach for 90 days for just $69. We've worked with over 8,000 Direct Sellers. Get your "Hands On" kickstart today!